Maren Hassinger, Flying, 1982. Photo: Adam Avila. 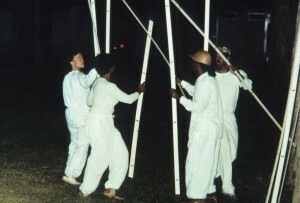 Artists Maren Hassinger, Senga Nengudi, and Ulysses Jenkins continue to investigate Kiss, performed in the 1970s and reimagined in October 2011 to celebrate the opening of the Hammer’s Now Dig This! Art and Black Los Angeles 1960-1980. Special guests, including artists who have worked with the trio since the 1970s, participate in this exciting iteration. Aspiring to accentuate the positivity and joyfulness of life, each guest offers a unique contribution to the performance. A meditation on pride and self-confidence, Walking Tall will culminate in an interactive audience experience. 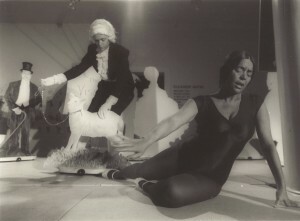 Eleanor Antin as Eleanora Antinova in Before the Revolution, 1979 at the Santa Barbara Museum of Art. Image courtesy the artist and Ronald Feldman Fine Arts, New York. Eleanor Antin's Before the Revolution, first performed at the Kitchen in New York in 1979, is a key example of the artist's critical, theatrical practice. The play explores Antin's imaginary character "Eleanora Antinova," a black American ballerina trying to make it in the great modernist Russian company of Diaghilev's Ballet Russe, where she encounters the histories and ambiguous realities of performance, racial profiling, and the magical promise of modernism and revolution. Performed by actors who manipulate Antin's original, hand painted, life scale puppets to enact this darkly comic narrative, Before the Revolution is a prime example of the artist's incorporation of a vaudeville sensibility into performance art, and demonstrates a daring attempt to consider race and gender in relation to artistic mastery. Antin directs the production along with Robert Castro. Before the Revolution is curated by Malik Gaines and Alex Segade and organized by in collaboration with the Hammer Museum as part of the ongoing programmatic collaboration between the two organizations. Visit pacificstandardtimefestival.org for the full festival schedule and ticketing information.